Sometimes I just love rainy weekends. When it’s sunny and warm outdoors, I feel a compulsion to get outside and ‘do something’…walk, shop, or visit a museum with my husband. But on rainy, nasty-weather days I don’t feel any sense of guilt about staying indoors, finding a cozy spot, usually on my soft living-room couch, and hunkering down with a good book. 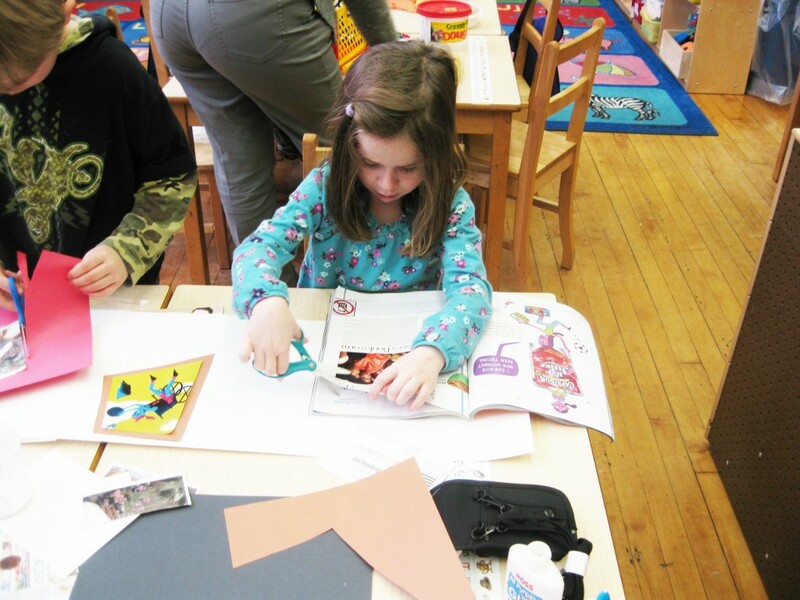 Early childhood classes, in these assessment-driven times, are inundated with programs to rush students into early literacy and ensure that instruction is in tune with standards. Children’s days are filled with word-study programs, leveled books, and tearless handwriting. It often seems to me that, within this rush towards academics, we’re losing sight of the true goal. The joy of reading and engaging in intimate discussions is somehow being left behind in the dust. encourage children to join the world of book lovers and conversationalists. This comfy, space invites children to curl up with a good book or to have a quiet, private conversation with a friend. This doesn’t have to take up much space. In fact the idea is to make it small and private. It just takes a little bit of ingenuity and reimagining of the classroom environment. My best role model for carving out classroom reading nooks is my friend and colleague Connie Norgren. She’s a master at designing private, inviting reading corners in rooms where space is limited. 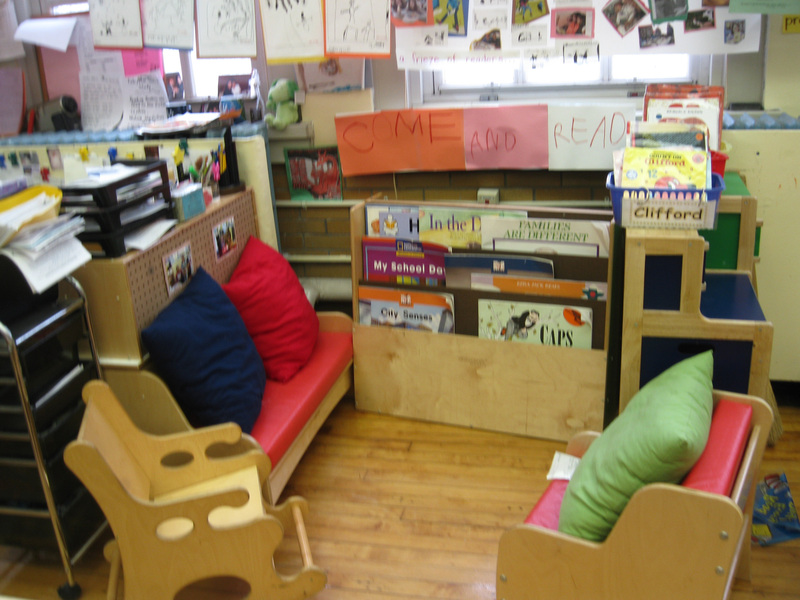 She created in her classroom the same inviting spaces for reading that she has in her own warm and comfortable home. If you don’t have small couches and easy chairs available, big pillows on the floor can provide soft seating. Look carefully at the photo. You will notice that the space is not packed with books. There are just enough books for easy browsing. This is also a reading corner decorated by the children. A child-created sign invites students to “Come and Read”. 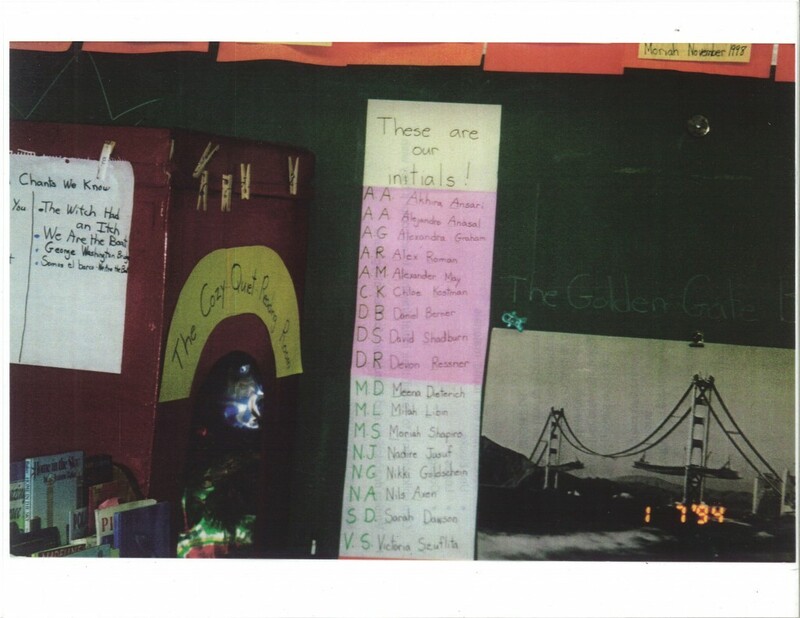 Above the sign is a reading frieze, made by a group of children during choice time. This wonderful piece of art is filled with magazine images and children’s drawings of people reading. The students have collaborated with the teacher in making this THEIR reading room! I created a private reading room in my kindergarten class by using a large refrigerator carton. (I actually do think that I first got this idea from Connie!). I cut out an arched entrance, put in two high windows (purposefully high so that the children inside would not be distracted by other classroom activities), cut out a circle to serve as a skylight in the roof and covered the floor with a big pillow. One year I covered it with a carpet square. A carpenter who lived near the school volunteered to construct a wooden frame for the box, making it sturdy enough to last a few years. My rule for using this new ‘room’ was that it was limited to two children at a time and it was a sitting space, not a standing space. Children love cuddling up with a stuffed animal or two. I remember peeking in and seeing Erika, a quiet, shy child, very seriously reading a book to a stuffed bunny rabbit, carefully being sure to show him the illustration before turning each page. I sometimes added little flashlights so that children could zero in on words and the pictures. This was an especially popular activity around Halloween time when we were reading In A Dark Dark Wood. During shared reading, I would turn down the lights and use the flashlight as a ‘pointer’. At Choice Time, children would then have fun bringing the big book into the “reading room” along with the flashlight. It wasn’t unusual to hear spooky sound effects emanating from the box, as two giggly readers jazzed up their reading of the story! Each year, the box changed a bit. One year, after visiting Reggio Emilia and seeing the interesting ways that mirrors were incorporated into their classroom environments, I “wallpapered’ the inside walls with Mylar to create a mirror effect. Other years I hung art posters or postcards. Sometimes the outside was decorated with drawings of scenes from favorite books. Children did these drawings during choice time as part of the “cozy reading room” choice. Other times they made new book jackets. For these, they first looked through books in the classroom library, picked one that they particularly liked, ‘reread’ the book to find a part of the story that would make a nice cover picture. I folded up paper for them so that it would make a book jacket. They then made the cover and added words to the jacket flap. The back flap had biographical information about the new jacket illustrator often including a photograph or self-portrait drawing! These new jackets were on put on display by the ‘reading room’. When I worked with kindergarten teachers at The Children’s School in Brooklyn, they put their own personal spin on the refrigerator box idea. 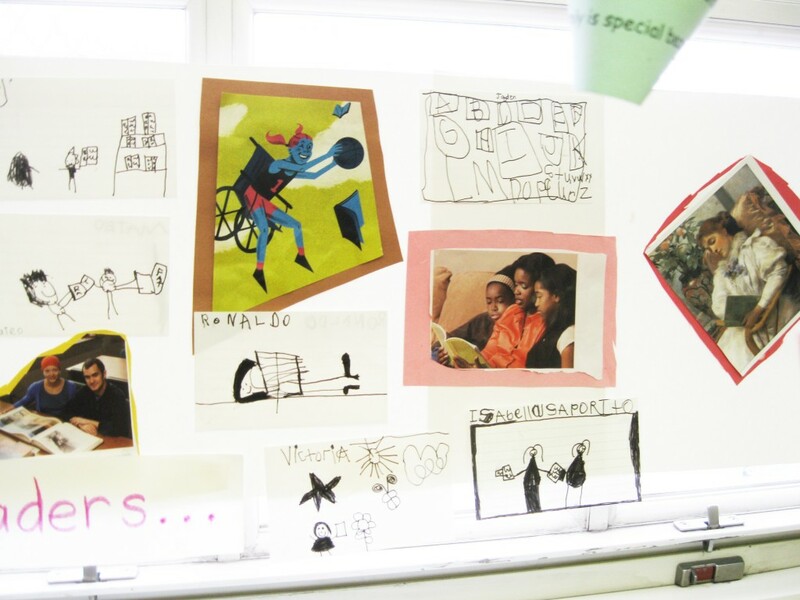 Since they were in the midst of a folk tale study, they invited children, during choice time, to decorate the outside of the box with images from favorite folk tales. My last few years of classroom teaching, I ‘looped up’ to first grade with my kindergarten classes. The first time that I did this, I asked the children, at the end of kindergarten, to think about how we would change the arrangement of the classroom to turn it into a first grade room. We listed what would stay and what would be packed away for my next kindergarten group. I knew that I had instilled in them the specialness of curling up with a book when I finished hearing their responses. There was one loud and clear, unanimous decision. We MUST bring our cozy quiet reading room in first grade! This entry was posted in Investigating Choice Time: Inquiry, Exploration, and Play on March 10, 2011 by Renee. Renee, this is so wonderful. What an important classroom space can be created with just a cardboard box! Thanks for sharing this. A big thank you to Maria Camastro at P.S. 10 in Brooklyn whose children are pictured here and who always has a cozy reading area for use during Choice Time and Partner Read Time. In my own past classrooms the “Book Nook”or the “ Cozy Reading Place” was for some years the refrigerator boxes that Renee describes — with pillows, a skylight and flashlights. Other years it was a piece of foam covered with a bedspread or blanket with pillows, a low table with a battery lamp nearby – and of course book shelves and ever-changing books. It was usually placed against a wall so there was space for displays: a collection of photographs of some of the many places where people read or a poster-sized photograph that might stimulate a child’s imagination: once for a time a diving whale with a sign over it that said, “Dive into a book!” After awhile the displays were thought up and made by the students. Parents have told me that their children set up similar book nooks at home. Sometimes the reading area turned into a quiet place for a child who was not feeling well to rest (and sleep) while waiting to be picked up by a parent — or a place to sit with a comforting friend (one of our class jobs) when a child was sad or upset. A small place in the room filled with soft pillows and books can’t help but add to the feeling that school is a place that cares about children and their feelings….as well as offering the joy of hanging out with books in the most inviting way. back then are in contact. Many of us went on to IS 88 and then Murrow. It sure was a different world back then. I wonder what happened to Ms Eisenberg, Mr Contursi, and Ms Grubstein. I loved all you guys. Even though the mini school was like an oven in june! Hi. I don’t know about Mr. Contursi. Gilda Eisenberg is, I have heard, doing very well. I often see Marilyn Grubstein on 7th Avenue in Park Slope.